And we're back! 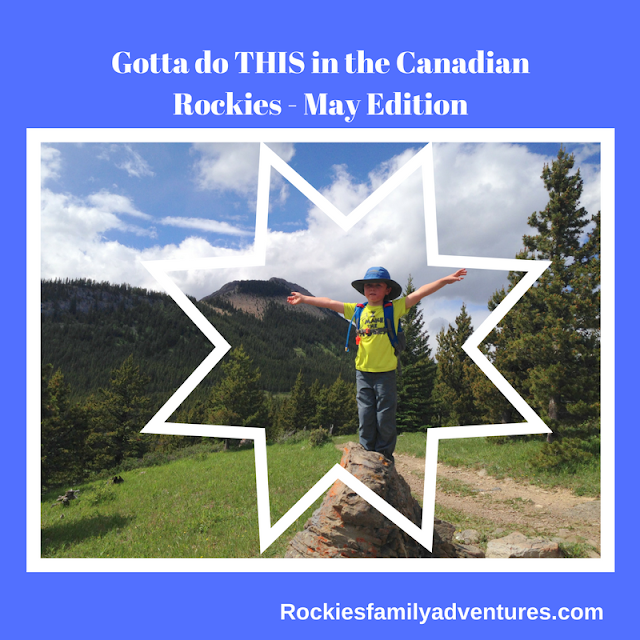 This is my monthly list of cool outdoor things to do as a family in the Canadian Rockies, focused on Southern Alberta. I also want to give you some fun ideas for how to celebrate Mother's Day and to offer suggestions for families still looking for something to do over the May long weekend. I am also featuring one getaway destination for those wanting to travel a little further. Time is too precious to spend every weekend in the city doing chores and yard work. Plan a fun family-friendly day trip or getaway this month and celebrate spring! 1. Attend Calgary's First Ever "YYC Fit Health and Fitness Expo"
The first ever YYCfit Health and Fitness Expo launches on May 13th and 14th with more than 100 booths featuring Calgary’s most popular boutique fitness studios, martial arts, fitness apparel, adventure travel and healthy eats! Families can enjoy the KIDfit Zone during the day which will include super hero training camps to get young ones moving as they learn skills from today’s most popular super heroes. Kids will also be given the opportunity to demo all sorts of different activities, and parents will have the ability to sign their kids up for classes on the spot! Two demo stages featuring displays and competitions including aerial yoga, hip hop dancing, boxing, powerlifting, and even a sword demonstration. A seminar stage, (with a no-sales policy) that will be full of engaging and informative presentations and several panel discussions. Special guests for the weekend including personal trainer and model Daniel Maguire, from the Bachelorette reality show as well as Emily Abbott, Crossfit Competitor recognized as the eighth fittest woman in the world. For full information on location, tickets and hours of operation visit the YYC Fit Health and Fitness Expo website. Coming to the KIDfit Zone….Superhero Training Camps! Yes, I know it will snow and rain - both in the same day! Still, it's a tradition and you know you don't want to sit this one out. Haven't made a reservation yet? Good news - there are still 30+ provincial park campgrounds in Alberta with space! For information on the campgrounds and parks above, please visit the Alberta Parks website and make reservations on the AB Parks Reservation site. I've also written reviews for many of these campgrounds. Links can be found on my Camping Super Guide page. Disclaimer: I am an Alberta Parks Ambassador and receive free camping. All reviews and opinions are my own. I still recommend biking in the Elbow Valley but I have other suggestions for you as well if you want to hit the highways and roads before they open to traffic for the summer. We chose to bike the old road rather than hike on the official trail. There's just one creek crossing you'll have to do if you follow the old road (where you'll leave your bikes) once you see the hiking trail on the opposite side of the bank. I have two top picks in Kananaskis for families wanting to get out and climb a mountain this month. Prairie View Trail to Barrier Lake Lookout - This great Kananaskis hike is an early season favourite with a beautiful ridge overlooking Barrier Lake. From there, the views only get better as you hike up to some big rocks (fun to scramble on) and then go further to the fire lookout house. Note, this trailhead is only accessible after May 15th. Spring is my favourite time to visit Jasper before the tourists descend on this small town in summer. The bike trails are dry and Jasper has a fantastic trail network. Step out of your tent and hop on your bike at one of the many great campgrounds situated just a few feet away from the Kettle Valley Railway converted rail trail. Our campground this summer will literally be on top of the KVR and we're very excited about being so close to one of our favourite bike trails. Spend your mornings biking the KVR, hiking local trails, or even rock climbing at the Skaha Bluffs south of Penticton. Then spend your afternoons chilling at a local lake where you'll find some of the best beaches in British Columbia. Round off your day with a wine tour (or two or three... - many vineyards are very kid-friendly,) play some mini-golf, or try out a Wibit Aqua Course in either Kelowna or Penticton. There is no shortage of things to do in the Okanagan Valley. The set of tickets includes two adult tickets and two children's tickets. The tickets are good for visiting the expo on Saturday or Sunday and can be picked up at Will Call at the event location. The contest is open to all adults 18+ who would like to visit the festival as a family. Please make sure you will be able to attend the event either Saturday or Sunday before entering the contest. Winner will be chosen Friday morning, May 5th and will be notified that day. I will contact the winner by email. If I don't hear back by the following Monday morning, I will choose another winner. The Rockies look like such a beautiful place to live with so many outdoor opportunities! 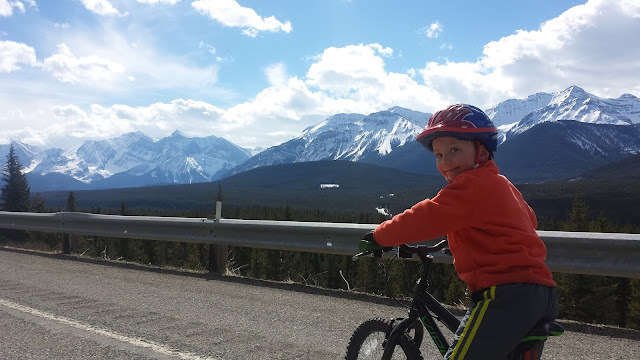 We love rolling together on paved paths such as Fish Creek, Bow Valley Park etc. I say rolling because I can use the scooter, my son on his 14" bike, & wife on bike. We love rolling especially on paved paths free of cars. My son on his 14" bike, me on his scooter & wife on her bike. oh too many! We love hiking, snowboarding, climbing, swimming as a family! Just getting outdoors is the best!